In our Research and Development Department we work with state-of-the-art instruments and passionate experts, as the first day. Market requirements are examined carefully and ideas gathered in order to produce new instruments and better current irrigation techniques. With regard to swimming pool components, we look for cutting-edge proposals, able to provide the best performances at the best price. Product number zero is ready. This is the moment for further tests and checks, in order to identify any eventual room for improvement. 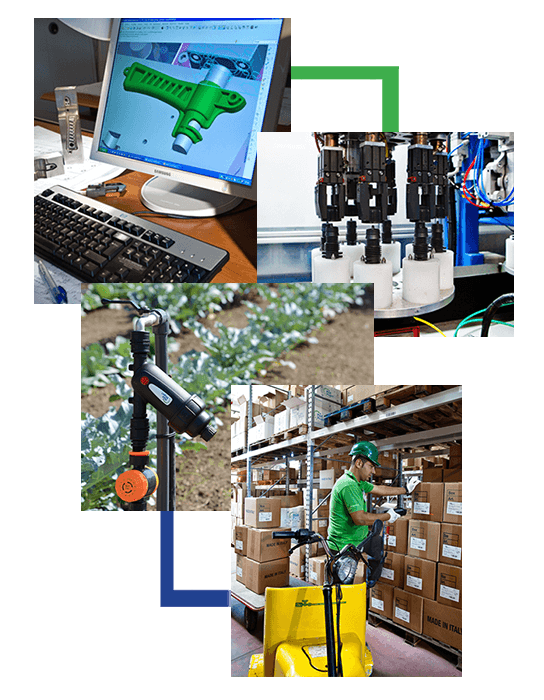 State-of-the-art moulding machines transform plastic material into thousands of irrigation items, in compliance with this field’s regulations. Packaging and warehouse departments deal with assembling, counting and packaging of the end product, until its storage and the preparation of the outgoing goods. Plast Project items start a new path towards companies and customers worldwide. Realising the project. Ideas take shape and are improved by the experience of highly qualified specialists. This stage regards the whole mechanical processing to create moulds and its components, with a high degree of accuracy and reliability. The moulding department is our company heart. Here all our products take shape. Another moment for testing. Before distribution, different kind of tests are carried out: mechanical, ergonomic, flow-rate related tests and a lot more. We have substituted hydraulic presses with the electric ones, powered with energy from renewable sources.